(Metric and US units) This program will provide a weld stress analysis for almost any weld shape that you can imagine. Cut a 30 minute weld design down to 10 seconds. You can draw your own weld shape or pick one of the common shapes from the main screen. 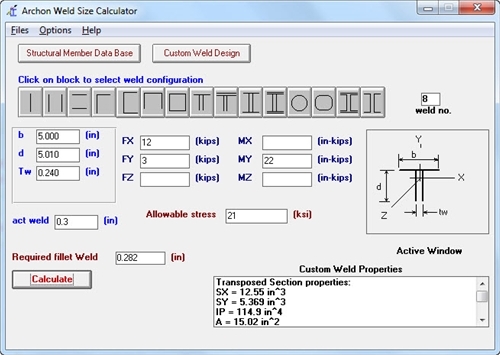 The Weld Calculator is used to size fillet welds or welds with throat values equal to an equivalent fillet weld throat. The user provides the weld shape, applied loads, allowable stress and material yield strength. The program will provide the required weld size. The program assumes E70XXX electrodes are used in the welding process. This version of the program allows you to select your unit type, either US or Metric units. There are two ways to specify the weld shape. First the user may select a pre-determined shape from the Main Screen or he may choose to draw a Custom Weld Shape. The custom weld function provides an unlimited number of possible weld shapes. This version also provides Archon's AISC data base. The user may select any AISC standard steel member. The dimensions of the selected member are transferred to the weld shape input screens. You no longer have to look up your steel shapes to get the dimensions, its automatic. You can also place an image of the steel shape on the custom weld screen and trace your weld along its edges. This application is compatible with 64-bit Windows operating systems.